The camera rests facing out of a dirty window. Approaching through the grime is a man and his dog. The man wipes the window with his hand and peers inside. It is revealed to be a van, flourished with psychedelic designs, in an overgrown clearing. He rummages around, picks up a few items, seems satisfied, and closes the door. They approach a cave entrance. Inside is a figure walking toward the interior, a gun holstered at the waist. The man has second thoughts about entering and leaves. A No Trespassing sign is visible as he drives off. The man is Hopper (Andrew Wilson), an archeology professor from an unspecified Texas university searching for some hippies that went missing years before. As he drives back, he phones one of his teaching assistants (TA for short) for help. Arriving back at his home he finds the TA, Jackie (Brianne Howey), waiting outside with his other TA, Taylor (Reiley McClendon). Since his phone call he has decided that he no longer wants help and tells them to stay. He returns to the cave to find the figure still in the entryway. This time he decides to enter. As he walks further into the mouth, a liquidy force field becomes visible and the figure suddenly speeds up and disappears from view. Cut to a few days later, the TAs have heard nothing from their professor and decide to go searching for him. 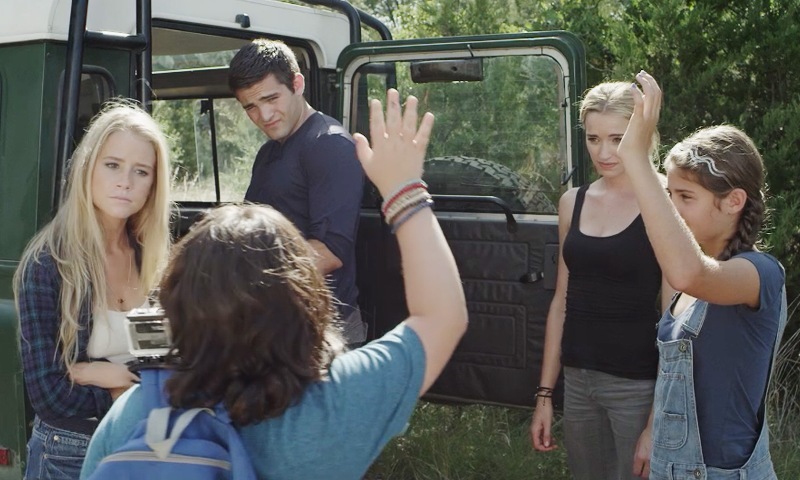 Since neither has a car appropriate for the road conditions, they call fellow student Cara (Cassidy Gifford), much to Taylor’s discomfort, because she can borrow her father’s Jeep. Cara brings along her thirteen-year-old sister, Veeves (Olivia Draguicevich), who in turn insists on including her friend Furby (Max Wright). The five go off in search of Hopper. Did I mention that they told no one where they were going? Nothing could go wrong here, right? Of course, it does. Once inside the cave, Taylor, Jackie, Cara, and Veeves (Furby is left above in case anything happens) find themselves stuck after the rope they use to climb down breaks (or was it cut?) leaving them stuck. To make matters worse, the four soon find out that time passes quite differently inside the cave. Time Trap is a sci-fi movie with a few horror-like elements thrown in. There are others that the group encounters in the cave, the before mentioned man with the gun is only one of the many, who pose a possible threat. This is not an action heavy movie though, instead, it focuses on the dialogue among the leads and the group’s reaction to their predicament – as they first see it – and their plans for escape until they discover they are in over their heads more so than they previously thought. Co-directors Ben Foster and Mark Dennis (Dennis also wrote the screenplay) keep things simple. The majority of the movie takes place in a few caverns within the cave and some exteriors outside of it with a couple additional locations making up the remainder of the sets. There are some effect heavy sequences, the ending uses quite a bit, but they are handled well and don’t detract from the narrative. Pacing is excellent, though there could have been some trimming during the final 10 or 15 minutes to keep the film’s momentum going. It really is remarkable how intriguing Foster and Dennis manage to make the movie with so little. Dennis does write himself into a few plot holes. Furby is left above in case they run into trouble below but it’s never clear if he has the car keys or not. In one scene he says he left the radio on all night causing the car to die before saying that he’d been alone for a few days. If he had the keys shouldn’t he have tried to go get help instead of listening to the radio all night? The amount of time actually going by while they are in the cave doesn’t seem to match up with what happens outside (I won’t say more to avoid spoilers but the movie doesn’t seem to follow its own rules). Sound also doesn’t seem to play by the rules. They loudly speak to each other yet none of the other people in the cave come to inspect although they appear to be in chambers close by to where the group initially entered. One of the students is shown using her phone in the cave before finally getting a no signal message. Shouldn’t it have not worked at all? Then the cave is well lit as the actors walk through it. Where is all this light coming from? I guess it could be argued that this was done for cinematic purposes. Despite its problems, Time Trap is a movie that works. It may not be the most original science fiction movie but it keeps the viewer engaged. At a scant 83 minutes, 87 minutes including credits, the movie is worth the time invested in viewing it.